ACTON, Mass. 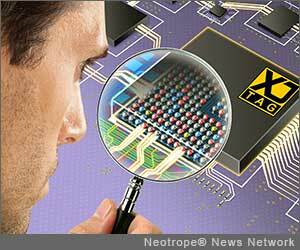 /Massachusetts Newswire/ -- Cambridge U.K.-based XJTAG today launched a new product, XJInvestigator, an advanced analysis and debug tool for use in the production of electronics. XJInvestigator is available as part of XJTAG's latest v3.1 JTAG boundary scan software release. In the U.S., Etoolsmiths of Acton, Mass., provides sales and services for the XJTAG Boundary SCAN product Line. Pat Shaughnessy, President Etoolsmiths, said: "XJInvestigator delivers all the information users need for board bring-up, debug and repair in one consistent user interface. Powerful schematic and layout views of board failures coupled with pin-level peek and poke access make XJInvestigator a great tool for fault identification." XJTAG's tools are used across the product life cycle from development and prototyping into production. XJInvestigator combines an easy-to-use testing environment with advanced fault-finding and debug capabilities, so engineers can diagnose boards which fail a production-line test. See the difference immediately on a test screen when you toggle otherwise inaccessible pins under BGAs; accurately pinpoint and solve problems using the layout viewer and pin mapping capabilities. XJTAG has also created a Fault Dictionary which can provide step by step instructions in fault diagnostics. Other updates include improvements to the code editor functionality and user permissions, and make for easy tracking and auditing. "With the launch of XJInvestigator, XJTAG has extended the test capabilities available to engineers," commented Simon Payne, CEO. "XJTAG focuses on providing solutions that can help speed up fault diagnostics. XJInvestigator has a simple pass/fail test capability that can be broken down and analyzed in detail. This makes testing easy and informative - you can not only find faults easily but also diagnose the source of the problem." If your organization is looking to get the most out of boundary scan, XJTAG can provide a fully-featured 30-day trial, including an optional free board set up, at no cost to you. XJInvestigator is available immediately from Etoolsmiths, U.S. stocking Distributor for XJTAG. To find out more, email us on sales@etoolsmiths.com or call us on 1-800-928-6038. Etoolsmiths provides sales, technical support and services for the XJTAG Boundary SCAN product Line. The company has its headquarters in Acton, Massachusetts. Press inquiries, please contact: Ruth Raymond, rraymond@etoolsmiths.com or www.etoolsmiths.com . XJTAG is a worldwide leading supplier of IEEE Std. 1149.x compliant boundary scan tools, which focuses on innovative product development and high quality technical support. The company has its headquarters in Cambridge, U.K. and works closely with over 50 experienced and professional distributors and technology partners across the globe. XJTAG delivers a diverse range of boundary scan test solutions for clients across a wide range of industries, including aerospace, automotive, defense, medical, manufacturing, networking, and telecommunications. Info: www.xjtag.com.